Today is 11 November. The day that we remember all the soldiers that have died for us since the First World War. at 11 o’clock the whole of the UK took two minutes of their time to honour the dead. as usual some people used it as a way to force their propaganda through. On sky News today there was a selection of Muslim UK residents that felt the need to burn the Poppy. this is a slap in the face for not just the families of soldiers in this current war but also families of any person who was killed in any war. we where the Poppy not as a way condemning the current war as a way of respecting those that they many of which were of the Muslim faith. I found this quote online from a veteran of war. we have also seen yesterday, the power of students. 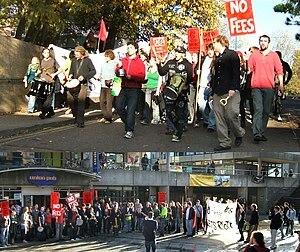 after finding out that the Liberal Democrats have gone back on their word about tuition fees, and that they will be raised students yesterday took part in a march against these rises in education fees. this March (that I was supposed to be going to) saw thousands of students take to the streets of London. Coaches from as far away as Scotland arrived in London to protest against the planned tripling of tuition fees and huge cuts the University funding. although this started as a peaceful demonstration it soon got out of hand. You have properly seen on the news the violence that erupted after the peaceful sit -in at Westminster. These people are got involved in the violence were apparently not even involved in a student demonstration. It just shows how some people will attach themselves to any cause for a reason to raise hell. do they not realise that by doing this it has taken all the focus away from the actual cause of the demonstration? On a lighter note, the game call of duty Black Ops has been released and I believe it has become the biggest game of all time. It doesn’t surprise me since the last game, call of duty modern warfare 2, was the highest grossing game before Black Ops was released. what has surprised me is that there haven’t been too many people blown away with the game in fact many review sites have claimed that is just modern warfare 2 polished. this has led me to wonder has the game just become a franchise. like sports games are they just going to release a new version every year with a few minor tweaks rather than recreating a whole game. i guess if people will buy you they will do the least amount of work as their income is practically secured anyway. I’m more looking forward to getting my hands on the fallout new Vegas anyway.